To get back to my German/Austrian roots, I decided to go to a Biergarten to reconnect and chow down on some German grub. Actually, I really just wanted an excuse to visit the Standard Hotel in Downtown LA, which is a stylish hotel with a flair of the artistic temperament. Throwing in some krauts, brats, beer, and big pretzels only sweetened the deal to make the Standard a must see destination. 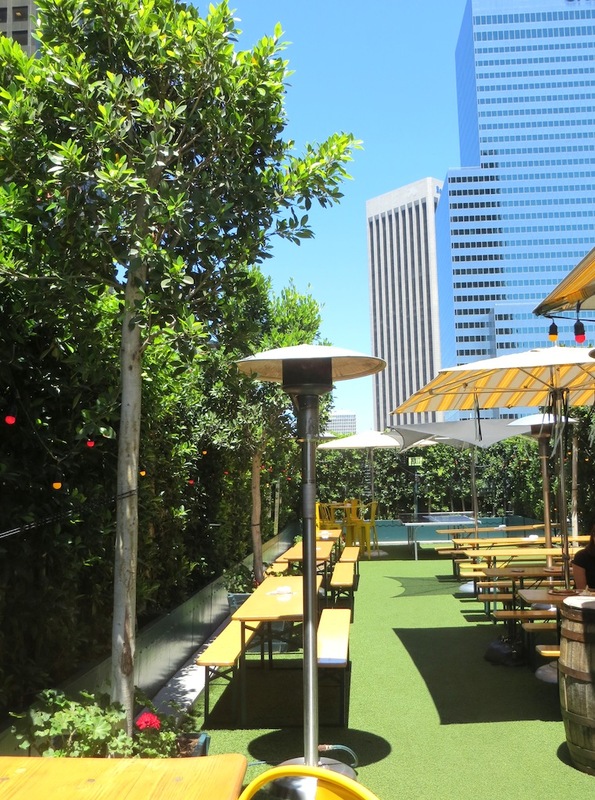 The Biergarten is located on the rooftop of the Standard Hotel and is surrounded by shrubs, which make you feel like you might be in the middle of the Black Forest (note the sarcasm). They also have ping pong and these delightful yellow chairs and benches that will surely fall over if you sit on them the wrong way, as we found out. 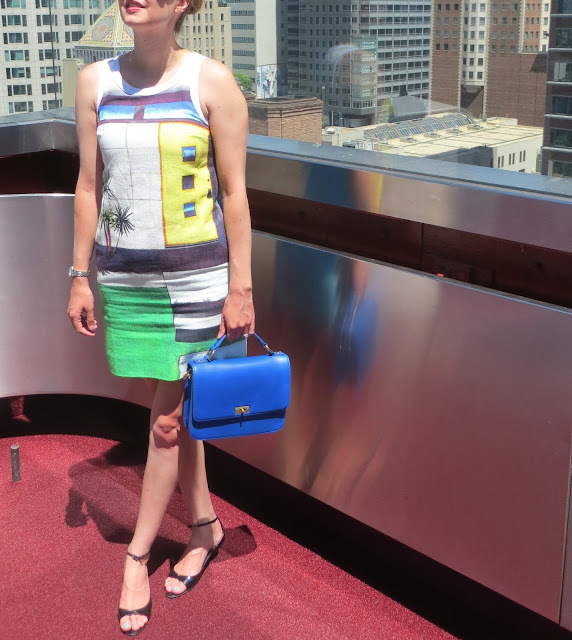 While I didn't have my Lederhosen on today (they were at the cleaners) it was the perfect day to wear the Anthropologie In-ground Painted Shift dress. The colors were a nice complement to all of the yellow and blue of the Biergarten. We had a three course meal, which included a beer choice, salad choice, sausage choice and choice of pretzel or strudel. 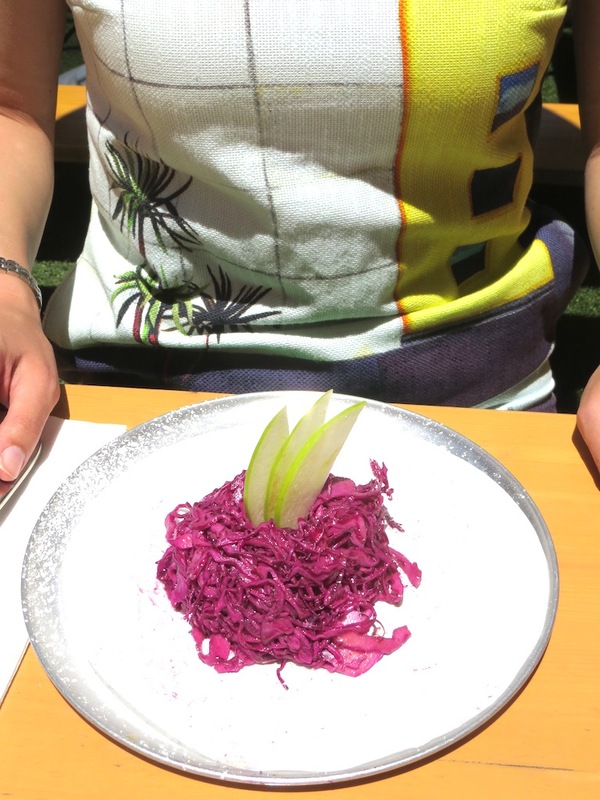 I chose the red cabbage salad with apple which turned out to be more ascetically pleasing than I had anticipated. The purplish color of the cabbage mixed with green apples was picture perfect. After lunch it was time to do some sightseeing and I wanted to take in all the views from the rooftop. While I am not a fan of the more modern buildings (and by modern I mean the ugly monstrosities from the 80s and 90s) that permeate the skyline of downtown LA, it is impressive to have a bird's eye view of the city. 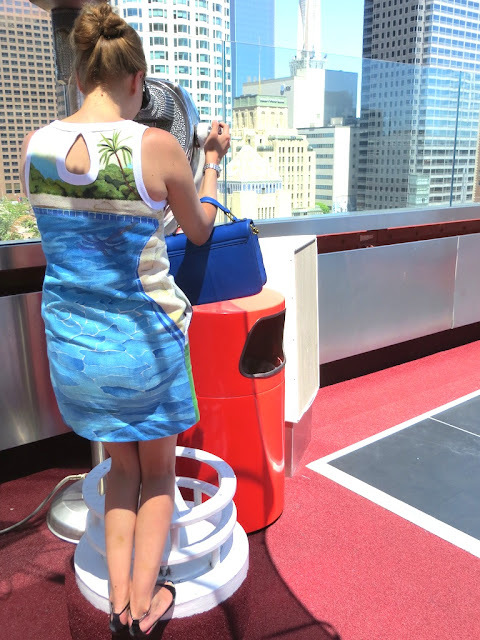 The rooftop of the Standard also has some fun topiaries greeting visitors as they get off the elevator. I think these are supposed to be dogs, frolicking in the sun. William would certainly like these. The inside of the hotel is a visual treat as well. They have ping pong on the second level, which is adorned by a picture of our current president hard at work. 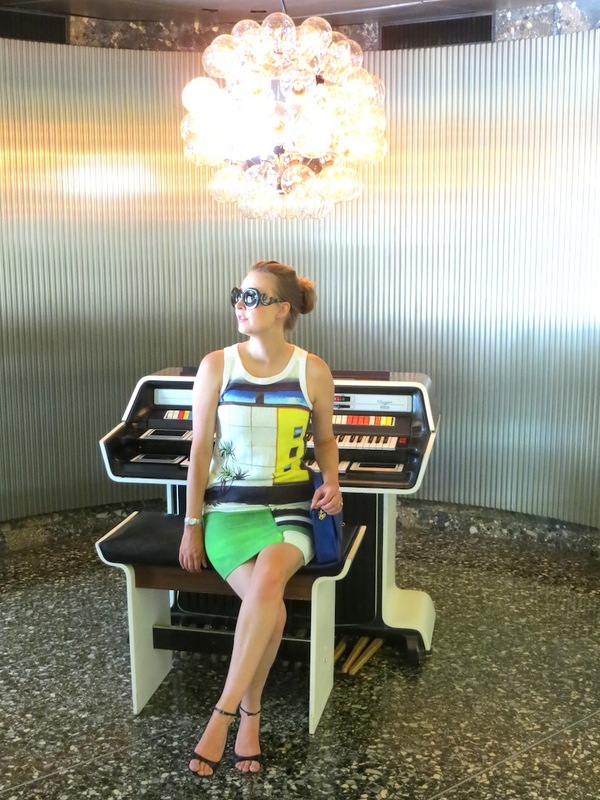 The picture below, which my husband is super proud of because it was his artistic vision, is of a vintage electric organ. This is the most you are going to see of my usually obscured mug. My Prada Baroque sunglasses are so big they sort of blur out my face like one of those black bars they put across people's eyes when they are in the witness protection program or something. I need to make sure I stay incognito. Here is the sign welcoming you to the Standard Hotel. It bothered my husband to no end that they print their name upside down. As you can see, the hotel has a very artistic, avant garde spirit, so I think it is quite fitting. My husband isn't exactly the artistic type (although I think he is a great blog photographer!). Even the psychic at the Moroccan restaurant we went to picked up on that, and she wasn't much of a psychic. Since I am more artistically inclined, this day and the hotel was right up my alley. Biergartens are great! As you said, it's the perfect place to go for a sunny afternoon...as long as it's not too hot!